CHOBE – LAND OF THE GIRAFFES! 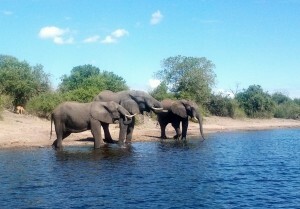 I still vote that Chobe is the place of the Elephants. Eleven year old Emma sitting in the vehicle next to me agrees, so we put a bet on it, splitting our game drive into two camps. Emma and I sit on one side of the debate, scrambling to tally up elephants as her parents and James count off giraffe wherever they spot a head sticking out from behind trees. Emma is a star at running our mini elephant census and she doesn’t miss a trick. Breeding herd. Eight. At least. (we add one or two more, just in case we’ve under-counted by a few legs). Emma’s parents up front are pointing at a giraffe behind a tree, but as we shift our focus to the tree line beyond it becomes two; then three, then four… This is the thing with giraffes, there’s always more. Having all that height equals an impressive range of vision. Giraffes can spread out in the bush and effectively keep an eye out for predators. It seems there are always more on the horizon, slowly chewing leaves and adding themselves to the scorecard. I won’t admit it, but I’m feeling a slight sweat coming on. I whisper to Emma that we need a distraction as I spot more giraffes coming up on the left. “Oh WOW!’ we exclaim, waving our arms for attention ‘what’s that on the RIGHT?! More ELEPHANTS maybe?” It doesn’t work. Team giraffe are busy counting and suddenly they’re in the mid twenties. This does not look good. I point feebly at a bush ‘oh look, more elephants!’ I say, substituting real sightings with fake ones. ‘No wait!’ Emma says stopping me, ‘there really ARE elephants!” and sure enough, another breeding herd. Add twelve. Team elephant is closing the gap. The afternoon seems to have passed in five minutes. We realise we’ve ignored the multitudes of impalas, waterbucks, buffaloes and, more importantly, the start of a sunset slowly melting across Chobe’s over-filled floodplains. As numbers climb into the thirties on both sides, James calls a truce and suggests we make peace over G&Ts as white-faced ducks socialise next to us by the floodplains. It’s a tense detente, but one that Emma and I finally agree is necessary to save team giraffe from embarrassment. Later, I’m joining my aunt on her first ever game drive with Connie, one of the Chobe Angels. A few minutes in, we start with the basics. “This is an impala’ says Connie ‘you can tell the difference between the males and the females because the males have horns.” It’s easy to get blasé about impalas when you’ve been on a few game drives, but my aunt is captivated and Connie really eases her into the bush experience. The pace builds quickly when we turn a corner and find a leopard chilling out in a tree, the blue of the Chobe River spread out behind him. I start telling my aunt how lucky we are when we drive on a little further and find a pride of nine lionesses strolling along the water’s edge. My heart stops in my throat as a big male kudu walks right at them and the lionesses slink down in the grass. With less than two metres between predator and prey, a lioness springs up and the kudu’s instinct to survive kicks in. He bolts off across the floodplains, throwing up bursts of water and sending birds shooting into the air. Lucky for the kudu, these girls are still young and haven’t fine-tuned their hunting skills yet, despite putting on an impressive show. When I begin telling my aunt how lucky we are again, two leopards in a tree appear and I suspect she thinks I’m having her on. One of the leopards has an impala up the tree and is busy snacking as the sky begins to grow dark. We head back to Chobe Game Lodge in the fading light, excitedly going over the events of the afternoon when Connie delivers again, spotting five lion cubs sitting in the dust. Their mothers are gone, probably looking for dinner, as the young cubs watch us from only a metre away. We’ve already taken plenty of photos. This is one of those sightings better enjoyed without a camera and committed to memory instead, as the light runs out on the day. 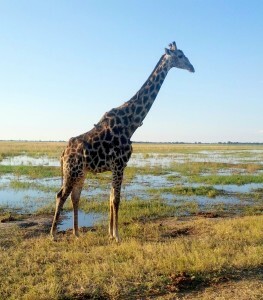 Chobe National Park is Botswana’s busiest due to its ease of access from Victoria Falls and via Kasane Airport without requiring any onward charter flights. Where travellers stay in Chobe will seriously alter the kind of safari experience they receive, whether it’s a town stay with park access for activities, within the park itself for a complete bush setting, or a river-based experience in the Caprivi Strip. Properties in Kasane are typically bigger hotels booked on packages with a set amount of activities and meals, often excluding drinks. 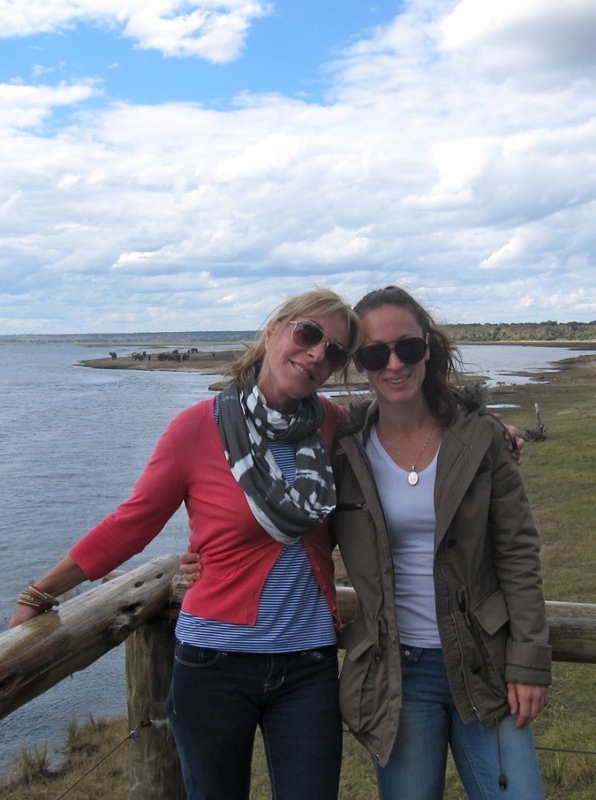 These are the most affordable options for exploring Chobe and activities are often out-sourced to third party operators with no guarantee you’ll have the same guide each time. Most Kasane hotels are on the river with their own jetty for boat cruises, though neighbouring hotels share the same route, making them the busiest departure points for getting on the river. For game drives, guests drive approximately 20 minutes to Sedudu gate and queue for entry with vehicles from other hotels. The result is that game driving into the park from Kasane results in a busier game drive experience, shared with more vehicles but often at a much more favourable nightly rate. Kasane Hotels: Chobe Safari Lodge, Mowana Safari Lodge, Chobe Marina Lodge, Chobe Bush Lodge. Smaller lodges in the area include Kubu Lodge, Chobe Bakwena, Chobe Chilwero and the Old House. Staying inside the national park creates a much more relaxed safari experience as you can start your game drives earlier and drag them out later, all the while staying in bush (rather than town) surrounds. Being inside the park also means being the first on the roads looking for sightings in the mornings and the chance to pick up animal tracks on the road before they’re covered over with tyre tracks from vehicles. Chobe Game Lodge is the only permanent lodge inside the park and the only place in Botswana where your boat cruise starts within the park, avoiding the boat traffic from Kasane. A mobile safari is another alternative for staying within Chobe National Park and experiencing the bush surrounds. Lodges on the Ngoma side of Chobe enjoy a bush setting (an hour from Kasane by road), elevated views over the Chobe floodplains and a short transit to the Ngoma gate for game drives. Although these lodges are outside the park, there are only three on this side of Chobe, meaning you avoid the queues at Sedudu Gate on the Kasane end of the park. Animals are often spotted directly from the lodges and short night drives are possible in the vicinity immediately around the lodges, due to their location outside the park. Lodges in this area operate their boat cruises from Kasane Town. Due to the distance involved, cruises are normally mid-morning (when the river is quieter) as part of a longer day trip through Chobe National Park. Ngoma Gate: Ngoma Safari Lodge, Muchenje Safari Lodge and Chobe Elephant Camp. Staying in the Caprivi is all about experiencing the Chobe River by boat. To stay in the Caprivi, you’ll need to check-in to Namibia even though you’ll share the water with boats from Botswana. There are three options: lodges on Impalila Island, houseboats and Chobe Savanna Lodge. Lodges on Impalila Island are very close to Kasane, meaning that there’s no advantage location-wise for beating Kasane’s sunset cruise fleet. Lodges here are in a prime position for fishing, being close to the rapids and also for birding with quite a few small heronries around the island. Houseboats moor at various positions on the river opposite Chobe National Park, and benefit from less surrounding boat traffic. The houseboats use smaller boats for cruising guests up and down on the Chobe River. There are smaller houseboats with four to five cabins as well as the larger Zambezi Queen. The Zambezi Queen is quite large, running on set departures, meaning guests stay with the same group for the duration of the two or three night cruises. Chobe Savanna Lodge is situated across from Puku Flats in Chobe National Park from where buffalo, elephants, giraffes and hippos are often spotted directly from the lodge. Savanna also enjoys the benefit of a more exclusive river experience being located further into the park. Caprivi Strip: Pride of the Zambezi, Ichobezi, Zambezi Queen, Chobe Savanna Lodge, Impalila Island Lodge, Ichingo River Lodge.